I was able to take a day off from schoolwork to sew. 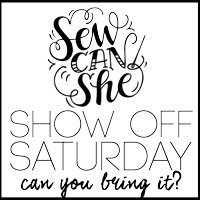 It took all day because I had a design in mind for an embroidery pattern I was testing for a designer, which I will talk all about tomorrow. Be sure to check back to see what I made. Along the lines of making the original embroidery design, I wanted to make something else. I started making a pocket for my own design and it didn't turn out as I had planned. 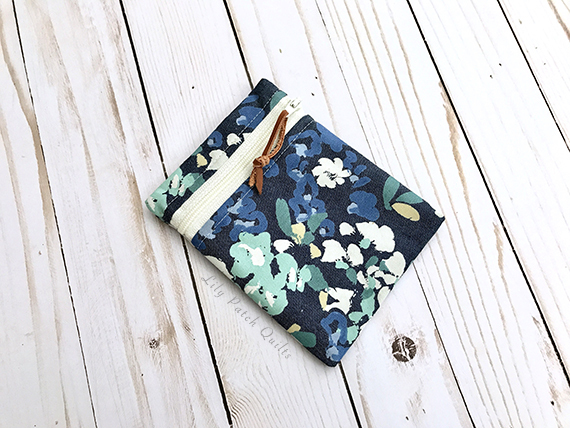 I didn't want this beautiful canvas denim from Art Gallery Fabrics to go to waste so I turned it into a mini zip pouch. It doesn't have the normal padding that I usually have in my bags and accessories but with fabric like this I didn't have the heart to throw it away. 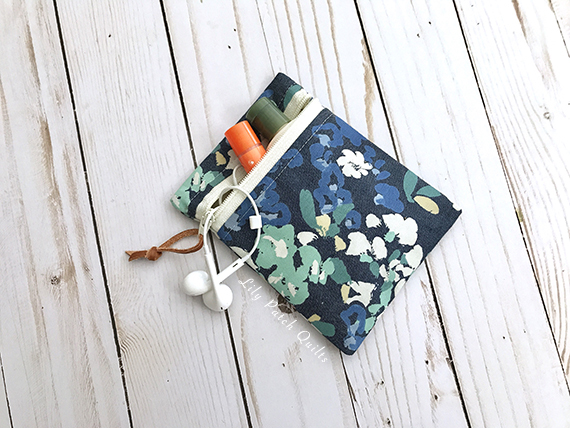 It is small enough for me to put my earbuds, lip smacker and lotion in with enough room I'm sure for other small knick knacks. I cut a thin strip of scrap leather I had to use as a zipper pull. The interior is lined with AGF's linen blend and no raw edges. Oh I'd struggle to throw that fabric away too, Kim... great use of it! This is a perfect bag to put things in that you don't want rolling around in your purse or beach bag. I love the fabrics, too.